I’m really looking forward to getting more pages done this week. I’ll be working hard on getting a big head start on pages. The new computers are working fantastically and again…this is such a fun chapter. I’m so glad you guys are enjoying it so far. Hang tight…it’s only going to get better. I was wondering. Did you guys notice in yesterday’s page. In the second panel that Nicodemus knocks a bunch of Dwarves into the air before being over-run by them? Some of the comments gave me the impression that it didn’t come across the way I intended. Thanks and looking forward to seeing your reactions to this week’s pages. Oh, yeah … I don’t know about anyone else, but I didn’t realize he was dwarf-kicking. ^^;;; Now that I look at the panel, I can see it. I did notice that there were at least 2 flying dwarves behind the sound-effects, however, I couldn’t tell which end was up. It looked like a jumble of limbs and no heads in the picture… okay, I see one faceless head, but I can’t tell how it connects to its body. It looked confused, but the gist was clear: Some sort of fighting. So it is probably more realistic than it would be if it were clear precisely what was happening :). I saw the flying dwarves but that Nic was being overrun I did not get. To me it looked like he was just showing off by roaring and lifting his arm. Yes, in real fights, it’s hard to see what’s going on until it’s over. and yes, let them help. Alex has the sword of dragonslaying! C’mon already. About yesterday’s page — I was a little confused by the second panel… The sound effects were competing with Nic’s word bubbles and it was hard to locate Nic among the flying dwarves. I recommend redrawing that panel and showing the dwarves climbing his leg or make the flying dwarves more noticeable (showing primarily their face as they fly at us). They’re just a tad dense headed. scott, I beg of thee, let a dwarf join alex’ bunch! anyhows, the word (if it is a word) THOOM! on panel 2 makes it look a bit chaotic (it was ment to be that way, but I mean negativly). Maybe the simple trick of dialog sharing could help out more. (Dragon- “Die you insects”!) Next Screen (Drwarf army – “Get him”.) (Dragon – [Tie-Bo Kick/Punch/Lunge/Tail lash] “Thoom”!) Drwarf army – “Ouch!” “Duck”!) Next Screen (Dwarf Army – Together people…We can do this!”) (Dragon – Never…OMG!!! Rwwrrrrar) What do you think???? That’s a little lengthy right? I hope it helps? hello I am new to this site my brother introduced me and I spent the whole day on Friday just getting up to speed. this is a great story line. thank you very much. I look forward to reading more. I was able to see that at least one dwarf was being knocked back through the air, but the “Thoom” did obscure it a bit for me. Maybe editing that would make the scene a little clearer, or adjusting the lighting/shadowing on the airborne dwarves. I really appreciate it. This helps a lot. I can’t figure out RSS feeds. I’ve tried subscribing to mine several times…but can’t figure out where to view them. Does ANYONE ELSE have a problem with my feed? I got the swarming part in the third panel, and now that I know what’s happening in the second panel, it makes more sense. And… wow with what’s going on in the current chapter! Everything’s really stepping up a notch! Yes, Scott, it was difficult to pick up on a casual observation. I think because of the background vs. the dwarf’s coloring being so similar. But I STILL love them. Thank you for sharing your talent. Well, at first glance on yesterday’s page I was mildly confused, but could figure out what happened with a second look. I wouldn’t change it though, because it was a realistic depiction of how chaotic combat is. I liked! Hey Scott, is there a map of dreamland anywhere? Yes. In all the books. Scott, Thanks… I was going to order my copy of the book from Amazon, but you had said it’s better for the comic if i bought it at the physical store. any news as to when they will be there? I personally haven’t had a change to go and inquire. I see it online at Barnes and Noble. I’m thinking they’re in stock this week. I got the general idea, but it might be beneficial to move the Sound effect to just over Nic’s hand, so that it isn’t blocking the dwarves. The issue I get is multiple posts. So when this page (749) went up, I also got the Matt Broom cover announcement, and the announcements for pages 748, 747, and 746 in that order. This has been happening since guest comic week, and it happens with every post you make, I get the last 5 in reverse order. UP side: I NEVER miss an update! Wow, just WOW!! I just finished reading all the archives and I’m HOOKED!!! I was pretty much hooked from the beginning but I was definitely hooked when Alexander and Nastaija kissed. I’m not a fan of the whole conflict in romance but I understand it’s place in storytelling. Thanks so much for your hard work and I will be buying up the books to date shortly. I had no idea that he had knocked dwarves into the air in that panel. I had no sense of motion or “before and after the blow” to give me the sense of something having happened. 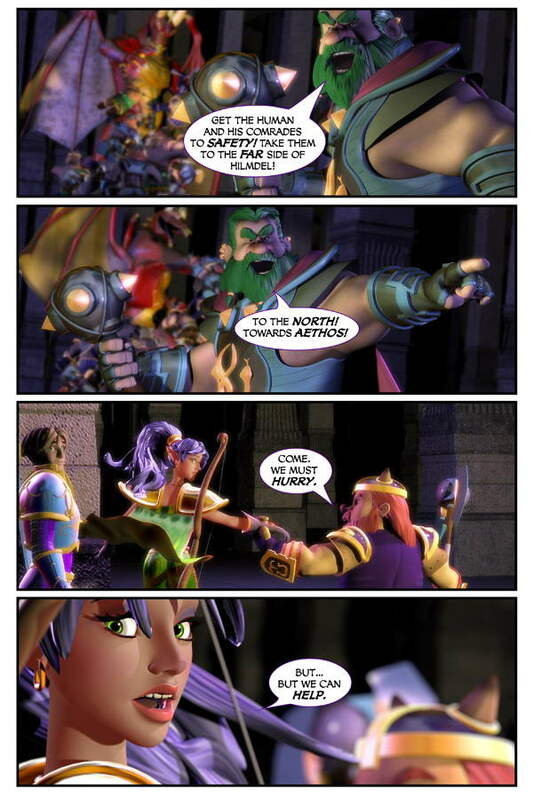 I think that what I had thought had happened was that the dwarves were beginning to climb up his arm, and I guess my brain just ignored the onomatopoeia of “THOOM” and moved forward to the next panel, where my misunderstanding of the events in the second panel seemed to be confirmed, because they continued to climb over him. I for one am loving this! But it makes me just as happy to see that you are! Well, I knew fighting was going on, but with the sound effect RIGHT over the image, and the lighting so low, I didnt actually know what was happening. The second panel doesn’t work for me either. It doesn’t really convey the intended action very well. I think you’ve gotten sufficient help as to the last page, so I won’t add to it. 😀 (I caught it even if it was a bit unclear) Elsewise, keep up the good work! I’m curious how they’ll get Nastajia and all to actually leave. Thanks Scott! I must have missed or simply forgotten that one… whew! you talked about new computers and I noticed (before reading the commentary) that the picture was sharper, crisper and the images seemed to jump out at me more I like it and I like where the story is going too. Look like ol nic might have a full blown civil war on him now, But I wonder if Alex is supposed to the king o f Dreamland? and also how much longer is Alex going to be asleep this is usually the moment when he wakes up. I just wanted to say that last frame is gorgeous. It looks like it came strait out of a movie! Children children… Let’s look back at the history of war. Lord of the rings, Dragon Age series, D&D… Dragons- 0, Dwarves- *Counts with his fingers* I lost count…. Dragons have a lot more than zero. You have no idea how many careless D&D adventuring parties try to take on dragons that they are not prepared for. The score may actually be in the dragon’s favor if you consider all the back story that usually goes with those other dragons, about how many they’ve killed, etc. The only reason we hear so many stories about dragons being beaten is because the times the dragon won are normal, not noteworthy.